Mindfulness is a cyclical thing. We have it, lose it, pick it up again, lose it again, renew it again, and on and on and on. But that’s not what we want, is it? We should be able to decide to be mindful, right here and now, and simply do it! And from then on, maintain clarity continuously and reap the benefits of unbroken connection with this living moment. At some point, after striving for perfectly continuous mindfulness and failing, you finally give up the idea that you’re perfect and just let yourself be human. No more expectation to be clear every moment, so now you can relax! Like the way you feel after buying a brand new car – you’re on edge, avoiding parking places where someone else might scrape it and hyper aware of traffic situations that could lead to a fender-bender. But after it gets that inevitable first scratch, you’re actually relieved. Now you can relax and drive naturally. Same with mindfulness, and most aspects of spiritual paths for that matter. You bump into clear evidence that you’re simply a human being, and not an enlightened-every-instant sage, and finally let that delusion go. This is much better! Mindfulness is something you do, not something you get. We’ve just begun a new year. Did you make any resolutions? Are you keeping them? Hard to do, isn’t it! Now, how many of those resolutions are the same ones you made last year? When you are consciously being mindful, that’s when you are mindful. When you are consciously keeping to your new years resolution, that’s when you are benefiting from it. It’s not like you make the decision to exercise more, to eat less, to meditate more, to be more compassionate, etc. and then suddenly have the result – you have the result exactly when you are doing it. Yes, all of these have residual effects, so if you go on a binge the result will last for a little while. But as you know too well, those effects wear off. You starve yourself for two weeks, lose 5 pounds, then go back to the old routine and those pounds slowly return. The answer? 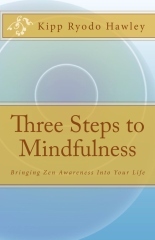 Maintain a cycle of mindfulness. Consciously bring yourself back to this moment continuously, forever. For your resolutions, exercise more today – whenever it is today! Be more compassionate, set aside more time for your meditation – today! Now! Take advantage of the cycles that are built into our culture. The new year, new month, week and day – let each be an inspiration to renew yourself. Expect that improvement is not a one-shot deal, but a continuous cycle, and see how your outlook changes. See how your results change. What is it that is True? There is That Which Is True. No matter what you call it, whether you find it through art, religion, science, basketball or by simply stumbling upon it, It is there. Or rather, here. None of the words we use to describe it, none of the names we give it, none of the pictures we paint of it are It – these are only pale attempts at pointing to It. So, what is it that is actually True? To be “True” with a capital T, it has to be true for everyone, everywhere, everytime. And once you look into it, you find it to be true without any possibility of being false. No way to argue with it, no way to spin it, no way to ignore it. So, another way to describe it is bare reality. That Which Is Real. Zen Mindfulness is anchored in That Which Is True. Connect and reconnect with It over and over and over again, and mindfulness is the natural result.